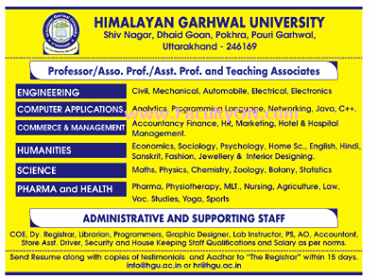 Himalayan Garhwal University, Uttarakhand has advertised in THE TIMES OF INDIA newspaper for the recruitment of Professor/Associate Professor/Assistant Professor jobs vacancies. Interested and eligible job aspirants are requested to apply with in 15 days. Check out further more details below. About College: Himalayan Garhwal University (HGU) is established and incorporated by Government of Uttarakhand Act No. 33 of 2016. Vide Notification no. XXXVI (3)/2016/48(1)/2016) of Uttarakhand Shashan (Vidhayee & Sansdiya Karyavibhag) and under Section 2(f) of the University Grant Commission (UGC) Act, 1956. Himalayan Garhwal University is situated in a peaceful and pollution free environment close to nature of Garhwal ranges of Shivalik hills. The Campus of University is surrounded by natural panoramic views which provides an ideal environment for higher education.